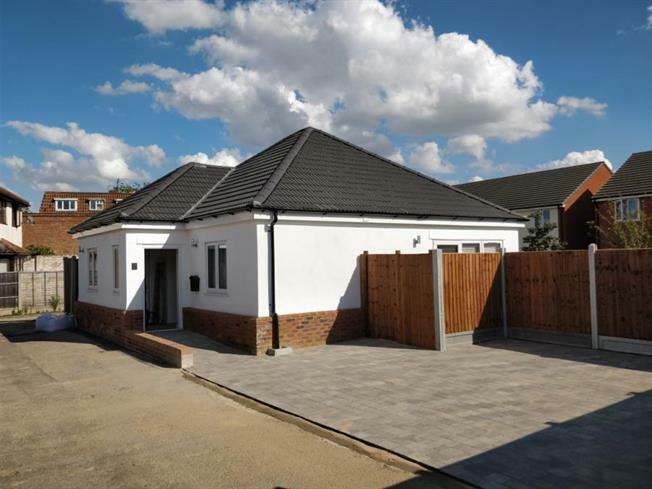 3 Bedroom Detached Bungalow For Sale in Rainham for Asking Price £370,000. The bungalow has been finished to a very high standard and would be perfect for a couple looking to retire or a growing family. Downstairs you will find a large combined living room and kitchen, with bi-fold doors, wooden floors and lots of light. The kitchen has fitted appliances and lots of cupboard space. There is a large bathroom, with bath, large walk in shower and a toilet/sink vanity unit. There are two large double bedrooms as well, with newly fitted carpets. Upstairs is a large master bedroom, with skylights, a WC and storage cupboards. There is a large patio area that wraps the whole rear of the house, perfect for entertaining and there is a lawn area as well. To the front there is parking for three cars max and a ramp for accessibility into the property.